FeastHome – Farmhouse style is related to something traditional and rural. This style usually uses a wood material to quickly bring the farmhouse look. But, do you know that farmhouse style is able to make any look, not only traditional and rural look? 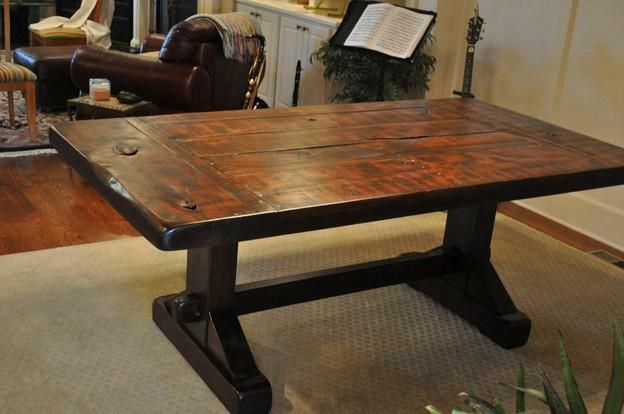 If you do not believe it, you can look at these farmhouse dining table designs. If you want to have an anti-mainstream and unique dining table and dining chairs in your dining room, you can have the ones like in the picture above. The dining table and chairs are low so that you can have a meal with your family members with the homey atmosphere. This kind of dining table and chairs are also suitable for you who have toddlers. They are safe so that your kids can independently sit on their own. The dining table and dining chairs in the picture above use a wood material in order to accentuate the farmhouse style. Even though this dining room has a farmhouse style dining table, it looks so pretty and sweet. Maybe it is because there are some flower pots and tablecloth placed on the table. The householders use various kinds of dining chairs, making the dining room looks attractive. The one dining chair maintains the natural pattern of the wood material, bringing a natural touch to the dining area. And the classy hanging lamp is creating a classic atmosphere. The window allows the sunlight to come into the area so that it creates a perfect dining area to have breakfast. This farmhouse dining table is very simple and natural because the original pattern and color of the wood material are maintained. This dining table is placed near the family room and surprisingly, it matches very well with the bulky leather single couch in the family room. Moreover, if you want to create an industrial look in your dining room, this kind of farmhouse dining table will be perfect. 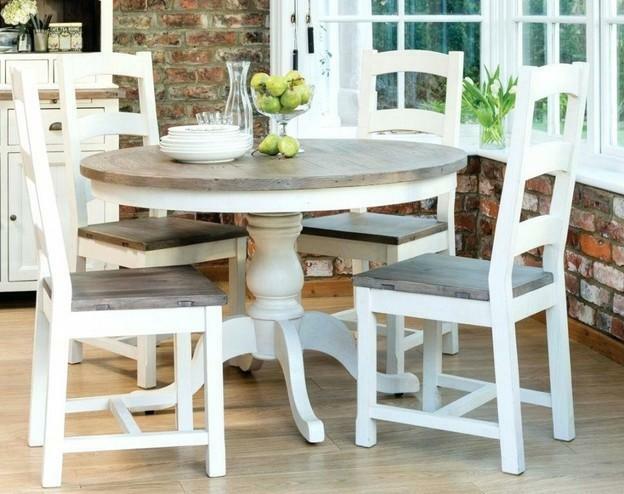 A farmhouse dining table or dining chair does not always have to use the original colors of the wood material. You can also paint it with your favorite colors. Just like the picture above. The natural color of the wood material is maintained only for the wooden dining floor and the top of the dining table. 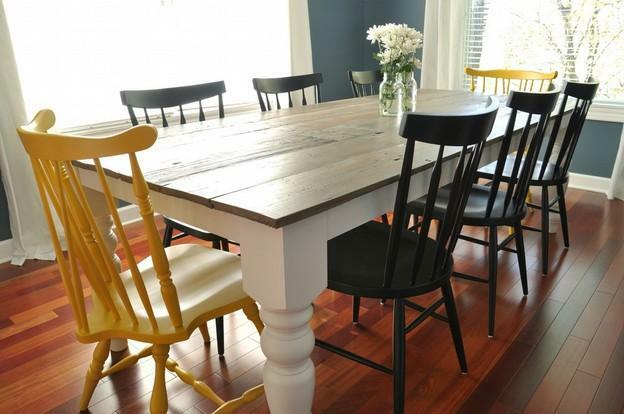 While for the dining chairs and table legs, the householders use other colors. The yellow dining chairs are successfully adding colors to the dining area. But, surprisingly they still blend well with the other colors. 2 big glass windows are added with a purpose to make the area looks larger. A dining table does not have to be big and square-shaped or rectangular-shaped. If you do not have enough spaces in your dining room or you have a small family member, you can use a small round dining table. A small round dining table is suitable to be placed in a corner area, just like the picture above. The top part of the dining table and dining chairs maintain the genuine color and pattern of the wood material used. 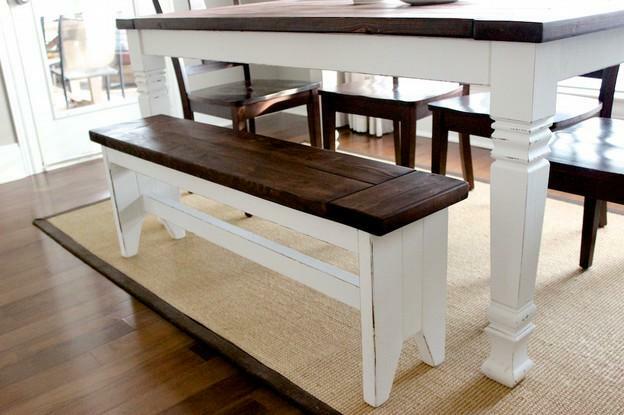 But for the legs, white is chosen so that the farmhouse dining table looks prettier. The brick dining room walls make the farmhouse style even stronger. 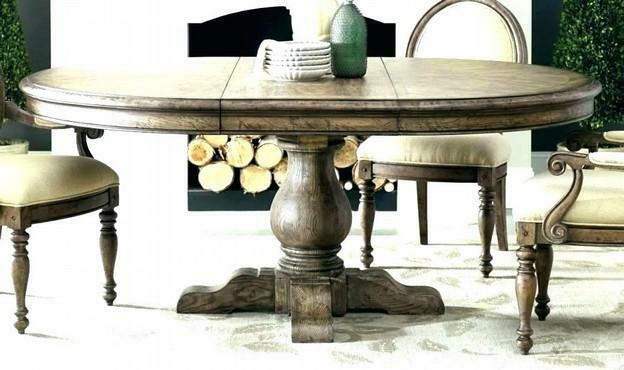 This farmhouse dining table looks very beautiful and old because of the faded natural wood colors. Look at the dining table legs, they are so old- fashioned yet stylish. The old-fashioned style is being accentuated by the surrounding elements such as the cabinets and the small rug. The red color from the rug is purposed to add a little bit of color to the area. For you who want to bring a unique traditional design to your dining room, this idea might be suitable for you. Having a meal in this farmhouse dining table will make you feel like you are having a meal in a garden, even though it is inside the house. Especially with the addition of the flowers on the table. Since this type of farmhouse dining table is usually used for a garden party or in the outside area. But surprisingly, it is also perfect to be used as an inside dining table. The patterned carpet is used in order to bring a unique pattern so that the area looks less boring. 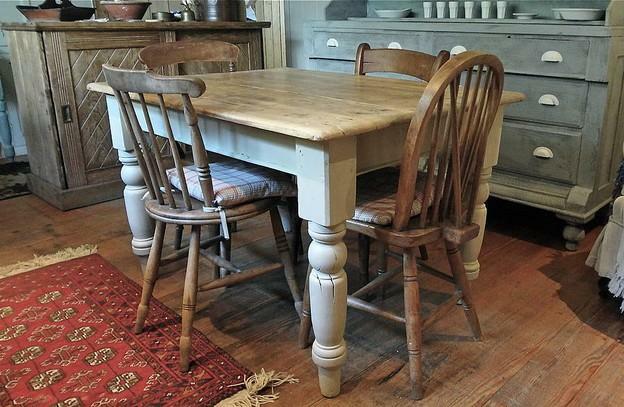 This round farmhouse dining table looks very antique. The faded and old original color of the wood material used makes it have an old and classy touch. A fireplace is added near the dining table area so that the householders are able to have a warm and comfortable dinner during winter and cold weather. 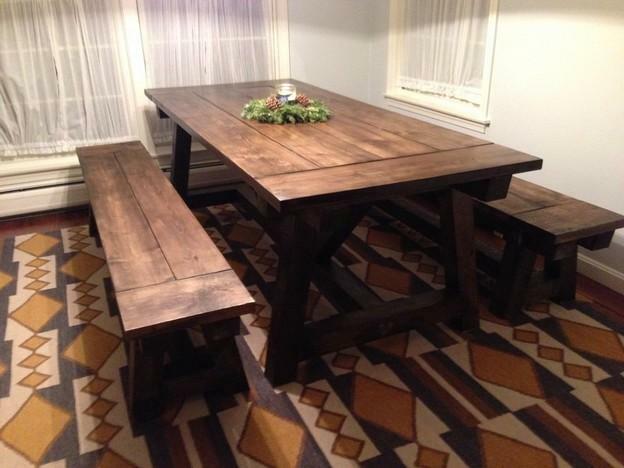 This farmhouse dining table looks very unique because it is quite high. The wooden bench used as the dining chair makes it even more unique. 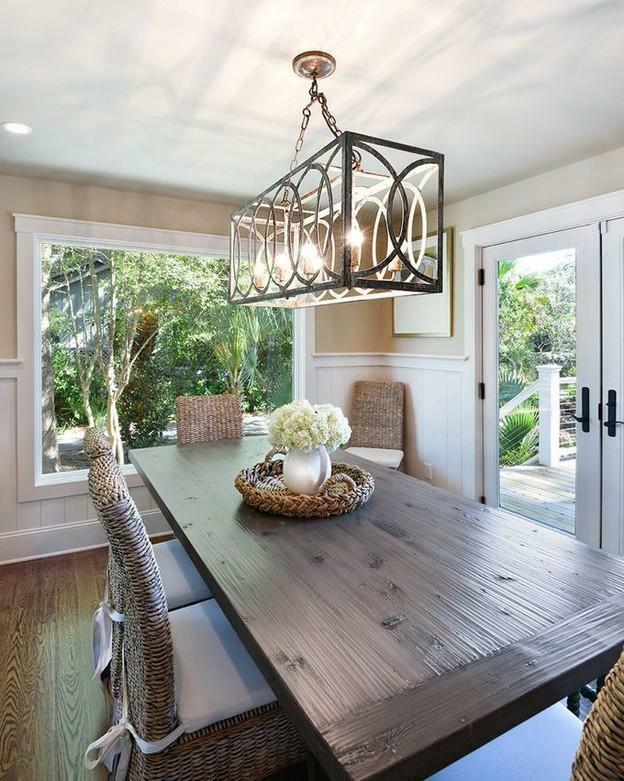 The wooden dining table and dining chairs blend perfectly with the wooden dining room floor. 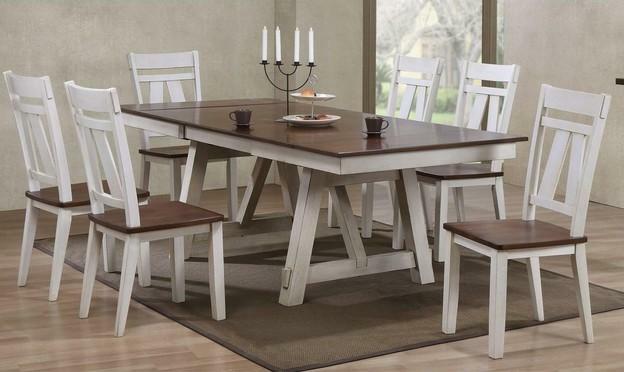 This kind of farmhouse dining table is also able to be placed in a simple minimalist dining room. The use of carpet can be used in order to determine which one is the dining area and which another one is kitchen area if you place your dining room in the same area as the kitchen area. First of all, the clear glass windows are really helpful in making the dining area to be the center of attention. The windows are also able to create a comfy and homey dining room for the householders. What makes this dining room looks beautifully different is because of the use of rattan dining chairs. And look at the white ribbon, making you feel like you are having a meal at a wedding party. The flower pots placed on the table sweeten the area. 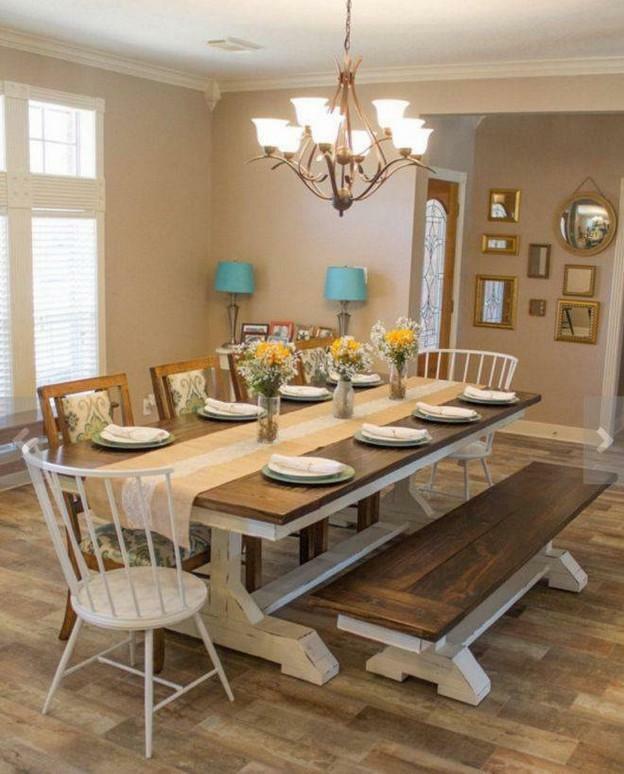 Having a farmhouse dining table will not make your dining room looks old and boring as long as you know how to style it, just like the inspirations above.